COPIC MARKERS-Copic Sketch Stamping Set B. Outstanding performance and creative versatility these markers provide the ultimate solution to design flexibility and artistic liberty. Fast drying; alcohol based; non-toxic; refillable; double-ended; marker that comes in a vast variety of colors. They are constructed in a unique design for a more comfortable grip and so they will not roll away from you; fit into a special airbrush system; durable polyester nibs are easily interchangeable and available in nine different weights and styles. Electronic production guarantees consistency of both color and output; precise colored capping system provides for instant color selection. COPIC markers are used by artists and designers worldwide. They are low-odor; blendable; and for use on paper; leather; wood; fabric; faux fur; plastics; and more. 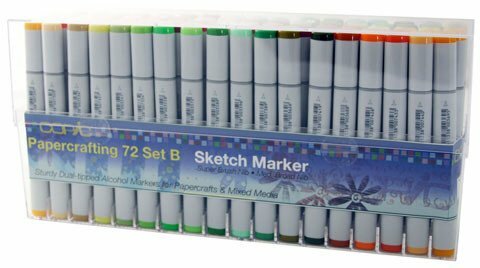 This set includes 72 markers. Packaged in a durable acrylic storage/display box: 6 by 12-1/2 by 2-1/2-inch. Imported.